bound and with labels all ready for posting off. Now, as you know, I do love to play. So out comes one of my scrap bins, yes I do have more than one of these. Two in fact, but this is the fullest or should I say overflowing. I do love to make something out of nothing or "scrap busting". So following on from one of the siblings quilts, I thought I would make mini blocks as I have quite a bit of the sashing fabric left. Oh, I do think they are cute, five inch scrap middles, then a two inch border of white and shadow. Also used were some orphan blocks. 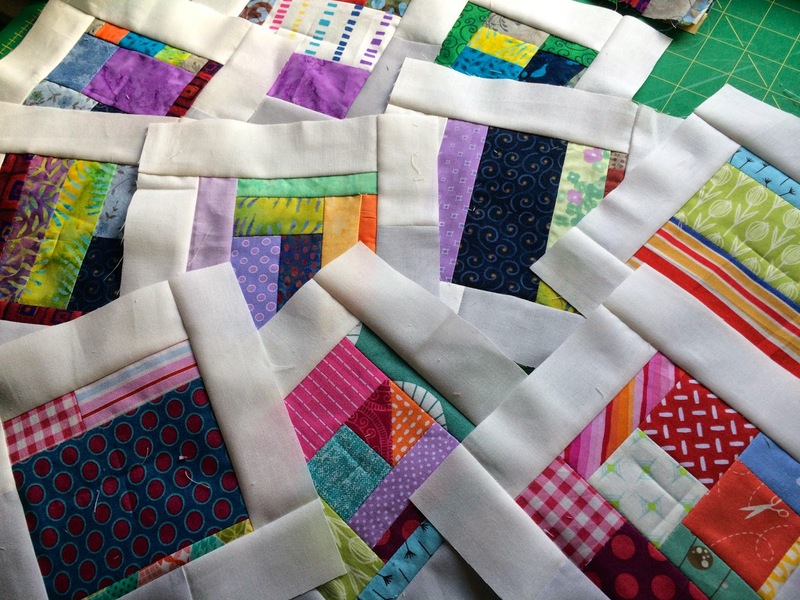 These blocks when finished are trimmed to seven and a half inches, so I shall need a lot more to make a quilt. Also, nearly finished the North Pole block for this month. Just the hand sewing to do. This has been a week of finishes with my first UFO finished, just the binding to do . It's very difficult to photograph even outside in natural light. 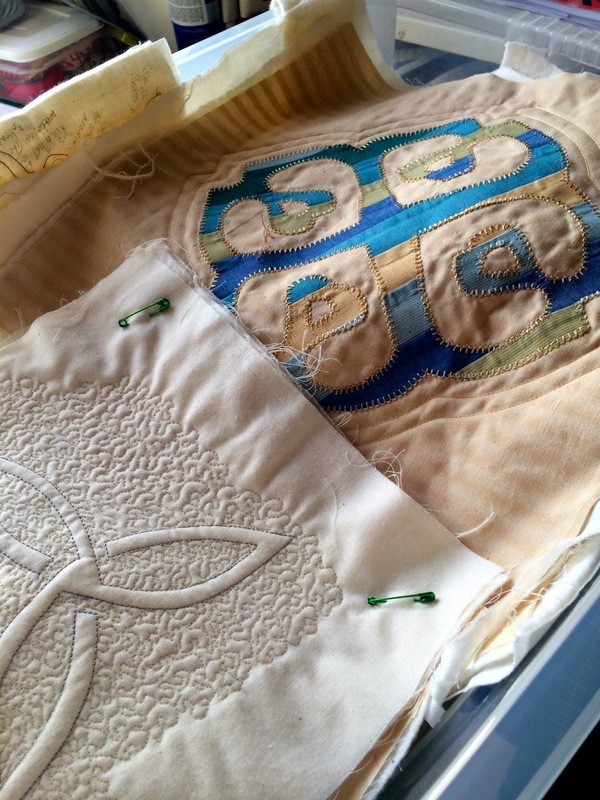 This is the binding going on, then my favourite bit of quilt making. 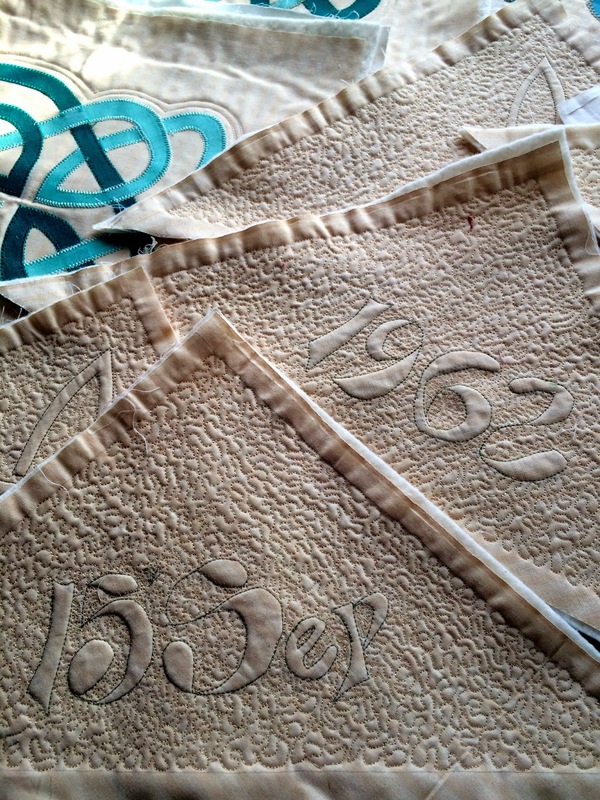 Hand sewing the back of the binding down, attaching a label and "voila" quilt finished. 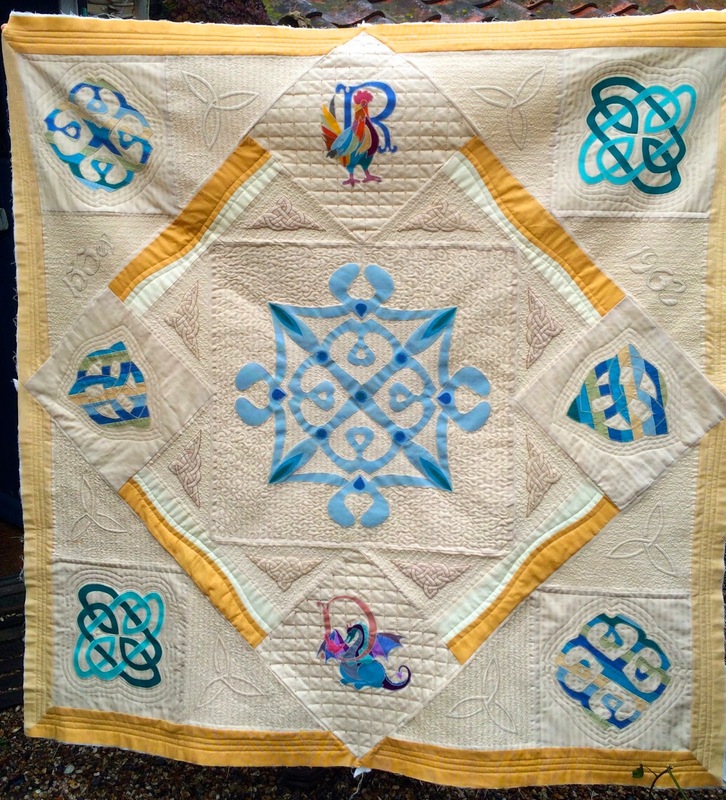 My next finish was the Siblings Together 2 group charity second quilt top. 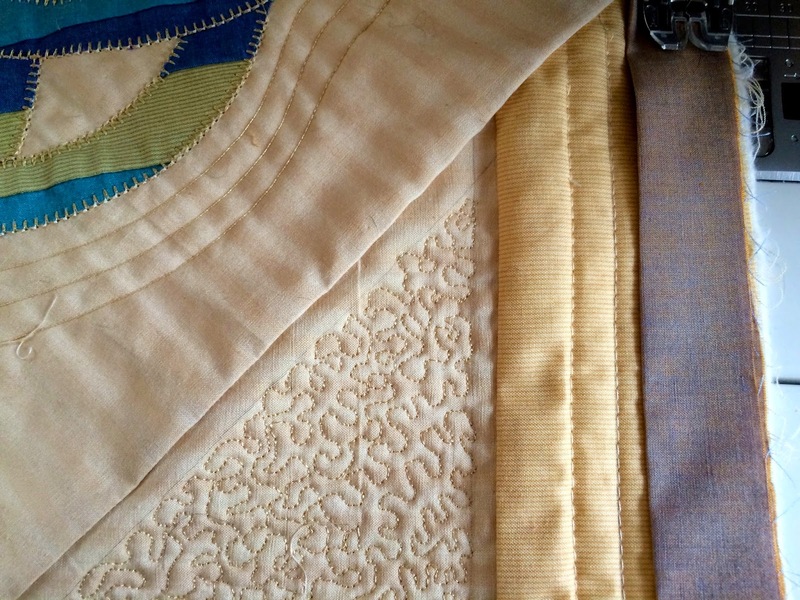 It is already for sandwiching with batting/wadding and backing. 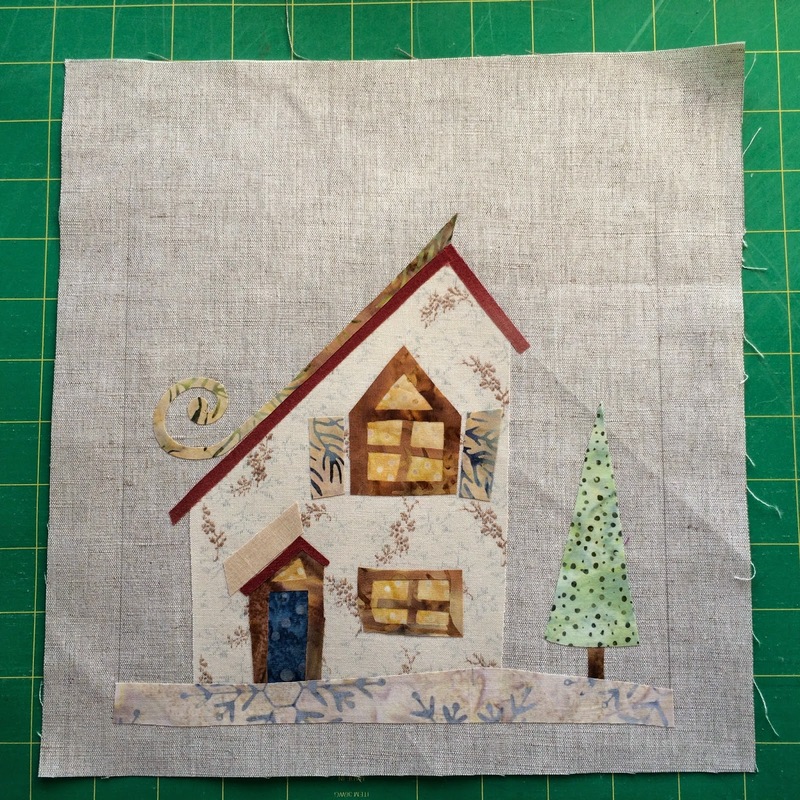 Then to quilt it, although at the moment I am not sure how I will do that. Any suggestions please.! Straight line or maybe cross hatching seems uppermost in my mind at the moment. 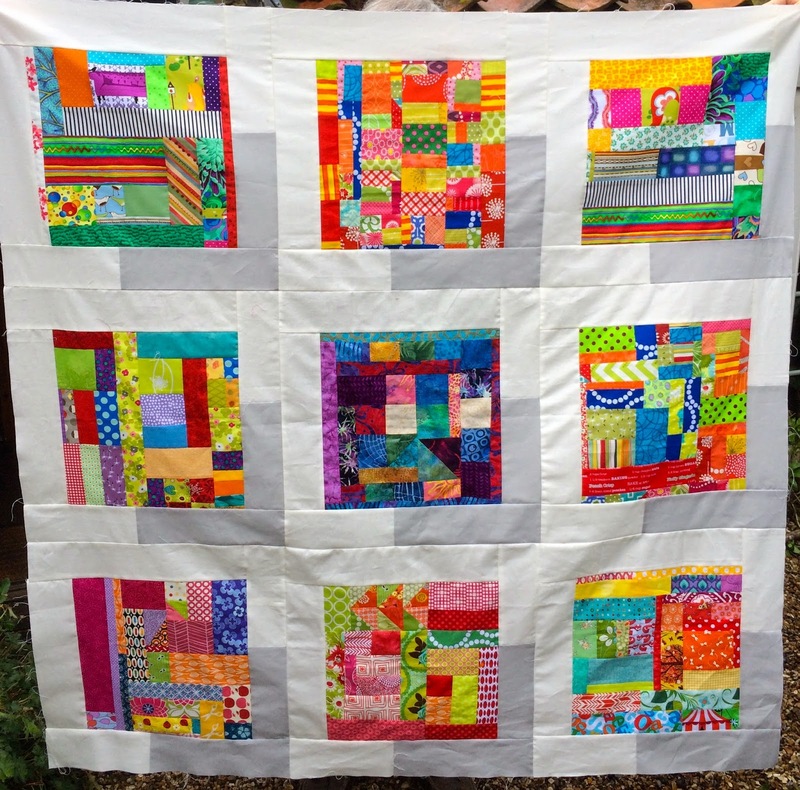 I do love this quilt as the coloured blocks look like they are floating. My friend Ann is the "mama" of the month this month for ST2 and has asked for 3 strip blocks, the middle strip being white and yep, have done them too! Hope they are OK Ann ? 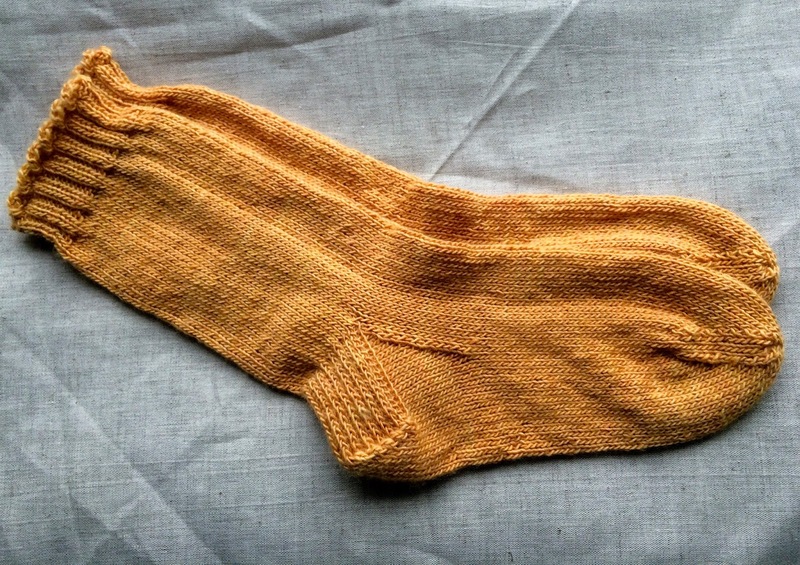 Finished also is this months pair of socks (way hay) seem to be on a roll. I just might keep this pair for me as I love the colour. Now to visit Perlen,Samt und Seidenttaft to see if she has put up the block for the North Pole Village SAL. And by the way, I am still plodding on quilting the Floral impressions Quilt by hand. I did say it might take a long time. I sound just like Captain Oates..
Time to start on a UFO. Yep, it is high time I started on a UFO. Even my daughter has done two already this year. So I got out the first crate and, low and behold, it was the heirloom quilt I started making two years before our 50th wedding Anniversary, and as this year we have been married 53 years its about 5 years old. Ha! I have a sneaky feeling there are some even older UFO's in some of the other crate's but this one will do for now. Not sure if that white block belongs. You can guess who this block represents. All the blocks laid out on the guest room bed so now where to start. 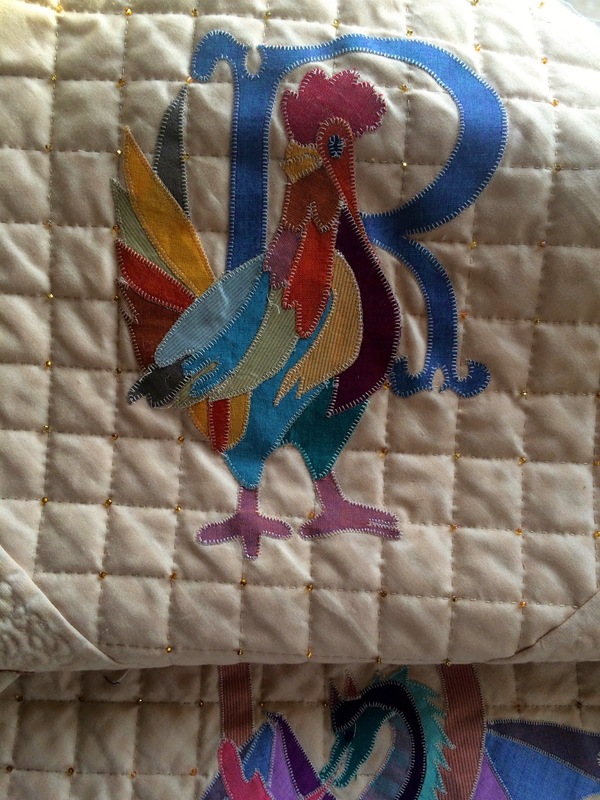 Not all the blocks are quilted so I guess I should start there. 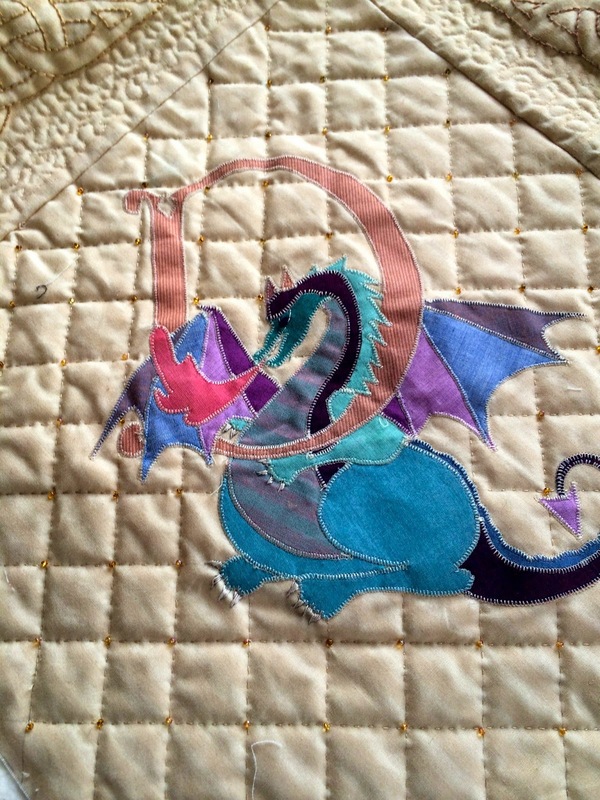 This is a quilt as you go project, the middle diamond is stitched together so it now needs squaring up. I have not been entirely idle. 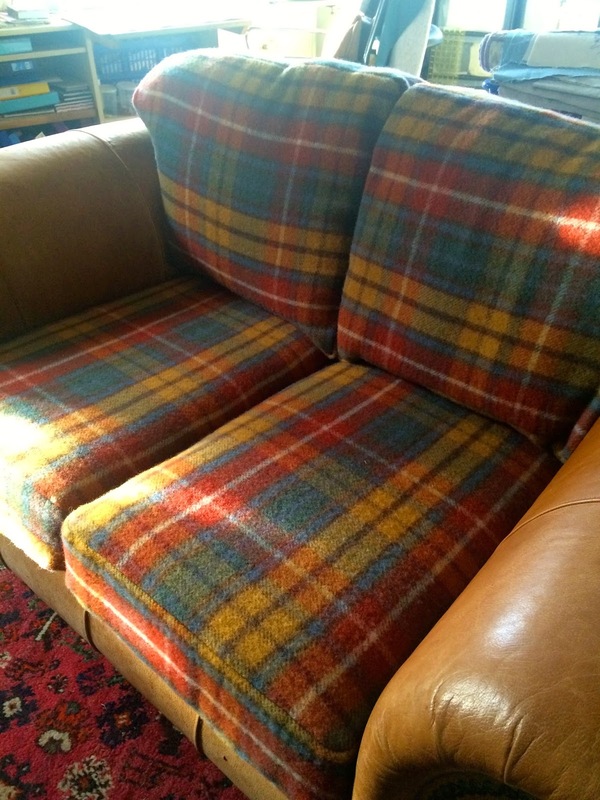 I did make some new cushions for the sofa in the sewing room on the weekend. Now to start on the first Un Finished Object, for those of you who are wondering just what a UFO was.